Residents are right to be skeptical of the state’s sudden claims that their water has been safe all along. Update 3/17: After continuous news coverage of the decision to lift “Do Not Drink” warnings, citizens have still not received an adequate explanation from state officials. In-depth posts like this one from the journalist behind Coal Ash Chronicles, Rhiannon Fionn, and this one, from Clean Water for North Carolina explain why the sudden decision is so troubling. Another cause for concern came this week when the N.C. Coal Ash Commission, which was created to promote transparency and restore the public’s confidence in regulatory decisions, was abruptly disbanded. Take Action: There’s still time for residents of North Carolina to attend a coal ash hearing or submit written comments. Duke Energy and the N.C. Department of Environmental Quality are controlling the narrative of coal ash cleanup and writing off the complaints of citizens most impacted by coal ash pollution. Help us hold them accountable. North Carolina officials owe residents and local officials in Lee County an apology, and they owe every North Carolinian an explanation. Over the past month, the N.C. Department of Environmental Quality and N.C. Department of Health and Human Services have walked back their own recommendation that families in Lee County not drink or cook using water from wells with carcinogens that exceed their own standards. The water is now safe, they say, and it always has been. Last November, private wells within a half-mile of open-pit clay mines in the county were tested to collect baseline data. Duke Energy plans to move more than 7 million tons of coal ash from sites in Lumberton and Goldsboro and dispose of it in the abandoned Lee County clay mines. The results from every well tested showed elevated levels of the carcinogen hexavalent chromium, vanadium or both. So, as they have for hundreds of citizens living near active coal ash ponds across the state, officials made sure affected families in Lee County received the message. Residents took steps to protect themselves and their children; they bought bottled water, installed filters, and avoided the tap while waiting for further instructions. They did what the experts said to do. 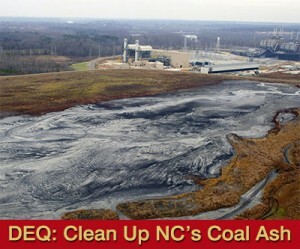 Learn the Truth About Coal Ash. Imagine their confusion now that those “do not drink” letters have been rescinded. Curious to learn what changed, residents packed a Lee County commissioner’s meeting on Monday where DEQ Assistant Secretary Tom Reeder and Dr. Randall Williams, the state health director, provided their side of the story but failed to fully address the problem or accept any fault. Given the opportunity for a public mea culpa, Reeder used misdirection and pointed to levels of the same contaminants in municipal water supplies across the state. Williams told commissioners the standards his department set were “exceedingly cautious.” They’re also apparently irrelevant. Without actually changing the standards, this decision allows the state to lift “do not drink” warnings issued to hundreds of residents living near coal ash ponds. Many of their wells tested at much higher levels for hexavalent chromium and vanadium than those in Lee County. Meanwhile, the DEQ is hosting hearings across the state this month, where data collected from private wells near coal ash ponds will be used to help determine the risk classifications and closure timelines for those sites. While top officials at the N.C. Department of Environmental Quality have repeatedly shown themselves to be clumsy when it comes to public statements, they always stress that they rely on the facts. But the situation in Lee County, and in other communities grappling with the threat of coal ash, shows the agency’s split-personality and an apparent disagreement on which facts matter and which can be ignored. “As far as the state of North Carolina is concerned, they can drink their water,” Williams told Lee County commissioners on Monday. But residents are skeptical of the state’s sudden claims that the water has been safe all along. Debra Baker, a resident of Belmont, N.C., was told nearly a year ago that her water was unsafe to drink due to elevated levels of vanadium and hexavalent chromium. Sign up to attend a coal ash hearing or submit a comment.